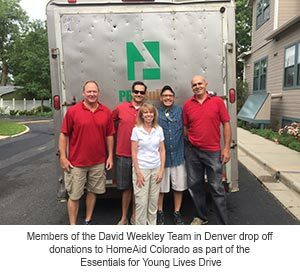 DENVER, CO (July 23, 2015): The David Weekley Homes Denver Team partnered with HomeAid Colorado for the Essentials for Young Lives Drive, collecting 2,875 diapers, 9,284 wipes and 283 ounces of formula from employees, vendors and members of the community as part of the company’s CARE program. Items from the drive, which was held from Mother’s Day to Father’s Day, were part of a larger drive that included 27 local companies. Collectively, donations included 39,784 diapers, nearly 80,000 wipes and 9,660 ounces of formula. Items were distributed by HomeAid to Denver Rescue Mission, Third Way Center, Hope House, Colorado Homeless Families in Denver, Emergency Assistance Association (EFAA) in Boulder, La Puente Homes in Alamosa and La Plata Family Centers Coalition in Durango, and will provide critical support to the families these organizations serve in their transitional programs and emergency shelters.